And is the kind of cookbook that I'm so fond of! 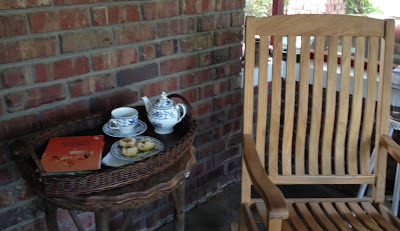 It's Thursday and I'm sharing my front porch tea with Sandi at Rose Chintz Cottage for Tea Time Tuesday. In an electric mixer fitted with the paddle attachment, cream together the butter and sugar until they are just combined and then add the vanilla. Separately, sift together the flour and salt. With the mixer on low speed, add the flour mixture to the creamed butter and sugar. Mix until the dough starts to come together. Add lemon zest and mix again. Dump on a floured board and roll together into a flat disk. Wrap in plastic and chill for 30 minutes. Roll the dough into 1 1/4-inch balls. (If you have a scale they should each weigh 1 ounce.) Dip each ball into the egg wash and then roll it in coconut. Place the balls on an ungreased cookie sheet and press a light indentation into the top of each with your finger. Drop 1/4 teaspoon of lemon curd into each indentation. Bake for 20 to 25 minutes, until the coconut is a golden brown. Cool and serve. Martha, I haven't made Thumbprints in ages it seems. 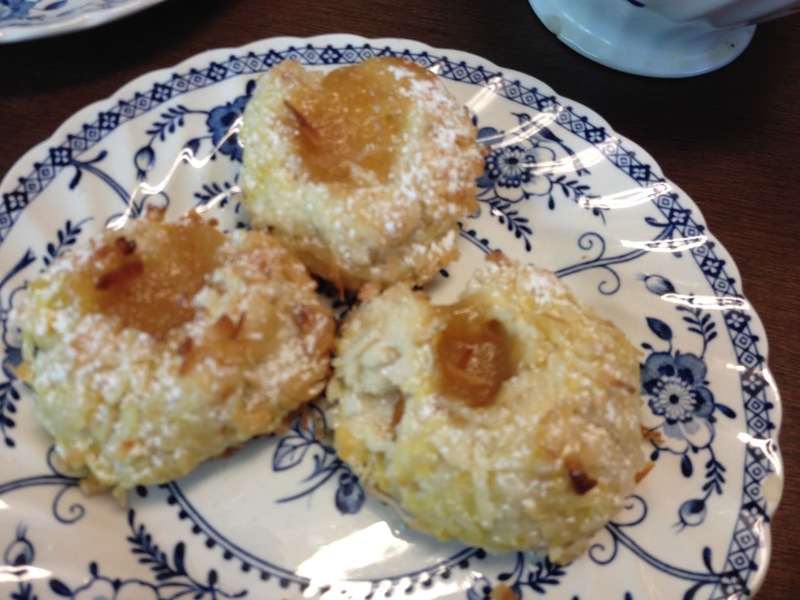 Yours look just wonderful with coconut and lemon; yum! I love JB Indies too although I don't have any pieces of it. Tomorrow may be a sitting out kind of day and I am having company. We'll see how it goes. I think our home is sitting in one of the windy capitals of the world. Thank you for joining me for tea and have a lovely week. 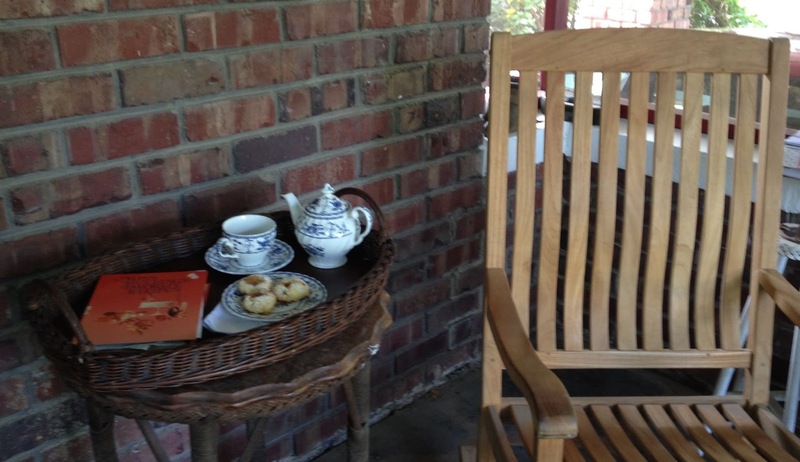 Your front porch tea setting rocks! The blue and white Indies pattern is really lovely! 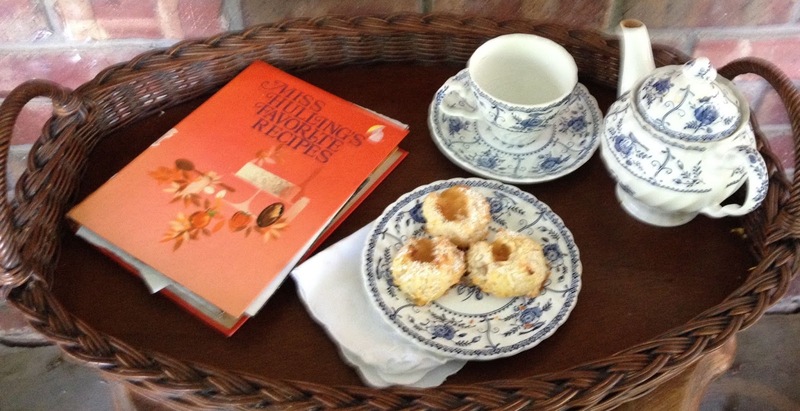 The wee 1 cup teapot is just perfect for tea and a treat! 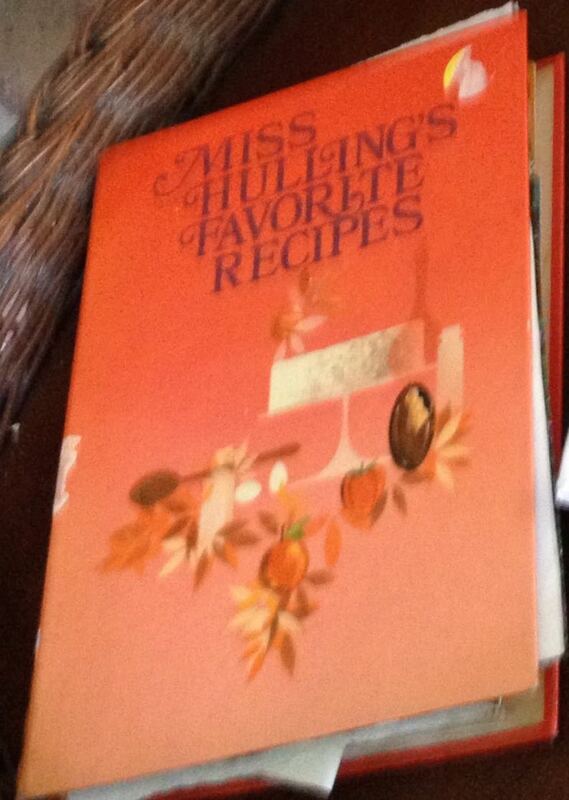 My mother always loved reading cookbooks so I have her collection. Hope you will take a peek of my celebratin. Post this week. I still think of your pretty town we visited when I see your blog! Those cookies look delicious as all your recipes turn out that way! Lovely china too! A shady spot. . .a cup 'o tea. .. and a good book. . .
a little piece of heaven on the Prairie, I'd say, dear friend!! !